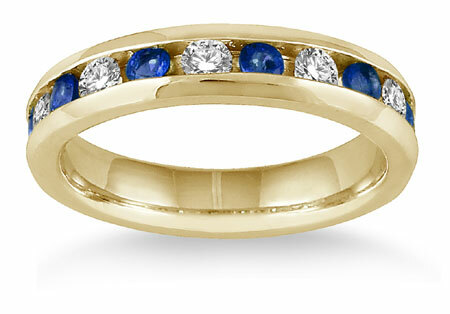 The timeless class of this 3/4 Carat Sapphire Diamond Band Ring in 14K Gold is hard to deny. This uncomplicated yet sophisticated piece frames the eye-catching contrast of two classic precious gemstones with warm shine to create a style that stands out for its simple yet striking beauty. The rich blue hue of sapphire and the versatile colorless dazzle of diamonds play off of one another in stunning fashion in this lovely gemstone band, each making the other seem even more breathtaking. Three quarter carats of small round sapphires are channel set into this ring, providing pops of deep indigo glimmer that give this style undeniable class. In-between these blue gems are small round diamonds, a half carat in all, creating a striped look that will never fall out of fashion. 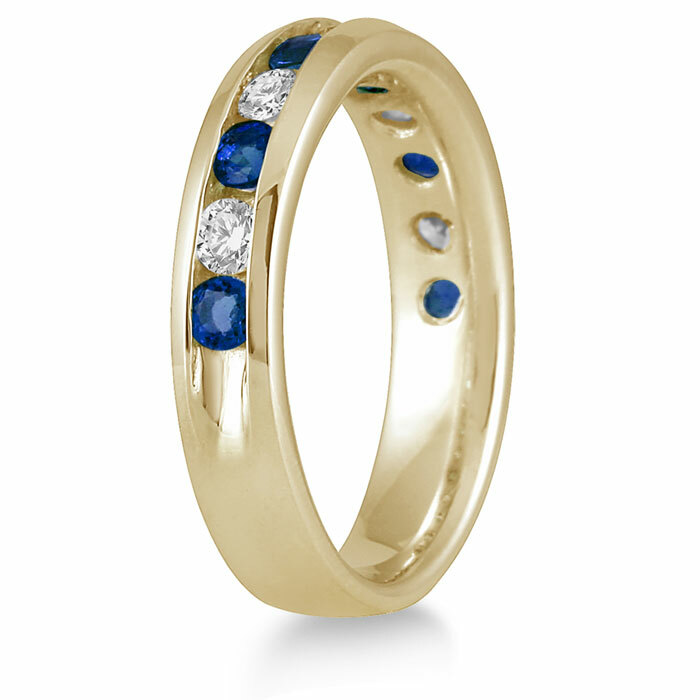 This 14K yellow gold sapphire and diamond ring is gorgeous on its own or paired with another simply-designed band. Try it with a similarly-styled ring with a contrasting gem or partner it with a plain gold band for a cool, stacked look. This sparkling piece could also serve as a unique and beautiful way to commemorate an anniversary as it provides a colorful twist to the timeless eternity band. We guarantee our 3/4 Carat Sapphire Diamond Band Ring, 14K Gold to be high quality, authentic jewelry, as described above.